Stavanger is the small city with big city restaurants, nightlife and facilities plus top attractions in and around the city. 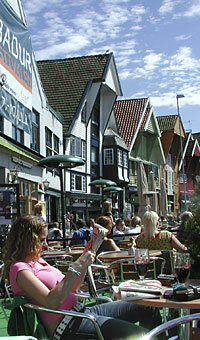 The Stavanger region has good travel links with England and the UK and is the natural place to start exploring Norway. It is just an hour or so flight time from Newcastle and Aberdeen, and two hours from London. The Newcastle ferry to Stavanger stopped in 2008 and will not restart before 2014 at the earliest. The top attractions here include a boat trip to Lysefjord, with its towering cliffs, taking you deep into the mountains, with Preikestolen (Pulpit Rock) on one side and Kjerag on the other - both amazing hikes with stunning views - and vertigo-inducing drops. The cosy harbour has a picturesque waterfront with colourful sea-houses and an old watchtower. Gamle Stavanger is Europe's largest old wooden settlement. The cathedral (Domkirken) dates back to 1125. Hotel availability can be very tight in Stavanger, but it is generally better at wekends. Our Hotel room booking system is unique - combining results from hotel chains with hotels you won't find anywhere else - and you see everything available for your dates.